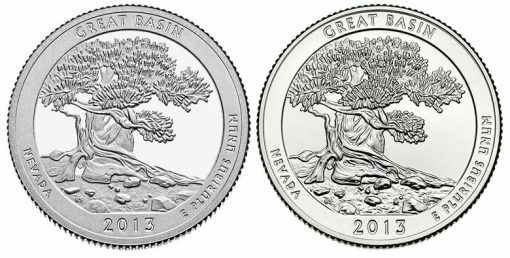 On Tuesday, June 25, 2013, the newest America the Beautiful Quarters Three-Coin Set honoring Great Basin National Park in Nevada went on sale. a proof Great Basin quarter from the mint facility in San Francisco. Each quarter has the mint mark to note the U.S. Mint facility from which it originates. 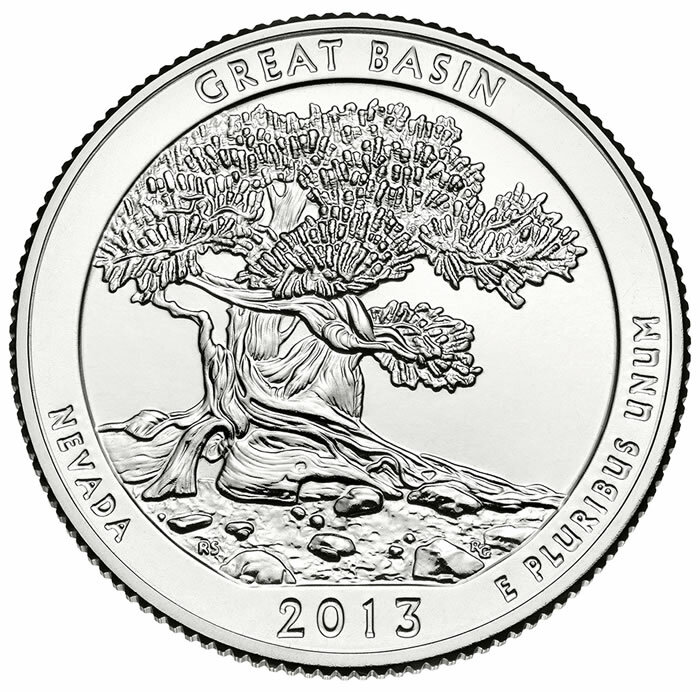 Great Basin National Park quarters are the third released for 2013, and eighteenth overall in the America the Beautiful Quarters® series. The three quarters are held in a durable plastic card that features a beautiful image and brief description of the national park and the coin. There is also a Certificate of Authenticity on the back of the card. Collectors can place orders from the U.S. Mint through its online catalog found here, or by phone at 1-800-USA-MINT (872-6468). Previous 2010-2013 America Beautiful Quarters Three-Coin Sets are also available. The obverse side of the quarter is adorned with a portrait of George Washington, just like all America the Beautiful Quarters. The portrait was created by John Flanagan for the 1932 circulating quarter. Since that time, the portrait has continued to grace the quarter with the image digitally enhanced for the America the Beautiful series. Inscriptions surrounding the portrait include UNITED STATES OF AMERICA, LIBERTY, QUARTER DOLLAR and IN GOD WE TRUST. America the Beautiful Quarters have reverse designs emblematic of sites of national interest from around the United States and its territories. 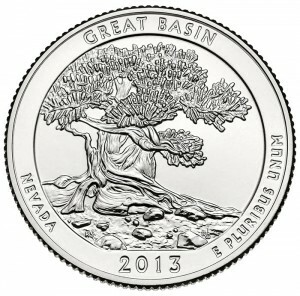 Found on the reverse of this coin is a single Bristlecone Pine tree with the rocky glacial moraines commonly seen at the national park (www.nps.gov/grba/). Reverse inscriptions include GREAT BASIN, NEVADA, 2013, and E PLURIBUS UNUM. The design was completed by United States Mint Artistic Infusion Program Associate Designer Ronald D. Sanders and executed by United States Mint Sculptor-Engraver Renata Gordon. Released earlier this year were quarters depicting and celebrating White Mountain National Forest in New Hampshire and Perry’s Victory and International Peace Memorial in Ohio. Great Basin National Park quarters were released into circulation and in bag and rolls on June 10, 2013. An official launch ceremony for the coin was held this past Thursday, June 20, 2013. The United States Mint will be releasing two more quarters this year as part of the series of America the Beautiful Quarters. The next quarter will be issued in August and honors Ft. McHenry National Monument and Historic Shrine in Maryland. The last 2013 America the Beautiful Quarter for this year honors Mt. Rushmore National Memorial in South Dakota. The rolls and bags for this quarter will be made available in November.